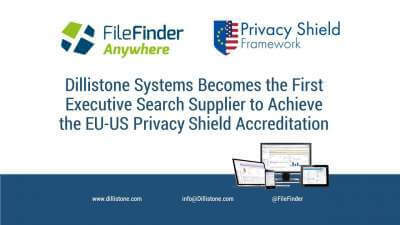 Dillistone Systems, the leading global supplier of technology to executive search firms, has become the first dedicated supplier to executive search to achieve certification under the EU-US Privacy Shield rules, joining technology behemoths such as Microsoft, IBM and Facebook on the list of fewer than 1,400 companies that have successfully completed the process. The Privacy Shield was introduced in June 2016 following the decision by the European Court of Justice declaring the previous “Safe Harbour” rules invalid. The new rules are considered to offer a higher protection to personal information. “The rules which underpin the storage of personal data are in the process of changing dramatically. The new Privacy Shield is important for Search firms that share data between the UK and US but is actually far less significant than the coming GDPR rules that will dramatically impact on how the Search industry operates,” explained Dillistone Systems’ Managing Director, Jason Starr. “These rules, which will be enforced from 2018, will dramatically raise the bar on privacy standards and will come with fines that are large enough to destroy virtually any search firm in the industry – and, indeed, virtually any supplier! We are committed to ensuring that we invest in our technology and infrastructure to help our clients stay within the rules,” added Jason Starr. Executive Search can email info@dillistone.com to request a copy of the GDPR White Paper. Dillistone Systems (www.dillistone.com) is the leading provider of Executive Search software powering recruiters and strategic recruitment teams around the world. FileFinder Anywhere is the latest generation of FileFinder Executive Search Software, a powerful, and yet easy-to-use, combination of database, project management, web research and CRM tools.